This page includes U.S. Varieties Clearinghouse Columns from the 1997 issues of Across the Fence Post. A variety of the 32c Riverboats issue released last year is available through the Philatelic Fulfillment Service Center in Kansas City. The variety occurs in the die cutting used to allow the removal of stamps from their backing paper. Because this is a self-adhesive issue consisting of five different designs, it created a special problem for PFSC personnel who had to affix a strip of all five stamps to first-day covers and commemorative panels. 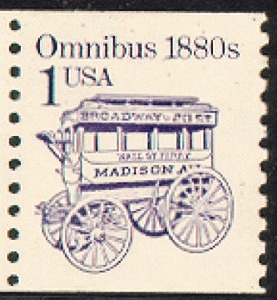 If the die-cut stamps from the general issue had been used, it would have required that individual stamps be peeled off the backing. The die cuts of each of the five stamps would then have to be carefully realigned when placing them on the covers or panels. The new die cut allowed personnel to remove an entire vertical strip of five stamps together as a unit. This was accomplished by providing three one-eighth inch skips in the horizontal die cuts between the vertical rows of the stamp designs. Personal experience has confirmed that the vertical strip of five stamps can be easily removed (with some care) and placed intact on an envelope. Additional differences between the general issue and special variety include the die-cut gauge (11 vs. 11.2, respectively), with cuts on the general issue extending to all edges of the pane but stopping short of the left, right and bottom edges on the variety pane. Furthermore, the die cuts on the general issue are more prominent because they penetrate the backing paper, and each pane has several additional rows of wavy die-cut lines on the backing paper itself. The special variety does not have any die cuts through the backing paper. The order number for the Riverboats variety is 448601. An entire pane must be purchased at a cost of $6.40. The variety is available only through the PFSC. Orders may be sent to: Philatelic Fulfillment Service Center, U.S. Postal Service, P.O. Box 419636, Kansas City, MO 64179-0996. Orders may also be placed toll free by dialing (800) 782-6724. Don't forget to add the proper postage and handling fees to your order. Please direct comments/questions to me at the address shown above. If a response is requested, please include a self-addressed, stamped envelope. One of the recently issued vending machine booklets produced by Minnesota Diversified Industries has been the subject of a large number of varieties and sub-varieties. The Midnight Angel stamp (Scott #3012) was produced in panes of 15 and placed into booklets of 15 and 30 stamps (see the December "Stamps the U.S. Postal Service Doesn't Want You to Collect" for background information on these booklets). In particular, the booklets of 30 have six major varieties along with over a dozen sub-varieties. In a breakdown of the major varieties, some booklets have "Item #3629" printed on the back cover, and others have "Item #3629X." In addition, some booklets have been found with an "Item #3629X" sticker placed over the normal "Item #3629" line on the back. For added spice, two different types of panes exist in each of the booklets. One type has the "Time to Reorder" label making up one of the 16 subjects of the pane. The other type has one stamp removed to make the pane contain only 15 stamps. The latter type was distributed to only two or three areas of the country. Here in Wisconsin, some post offices that receive their stamps from the Stamp Distribution Office in Green Bay were fortunate enough to get some. Many smaller post offices are selling them over the counter and may still have some left in stock. The booklets have "Item #3629X" on the back and are well worth looking for. 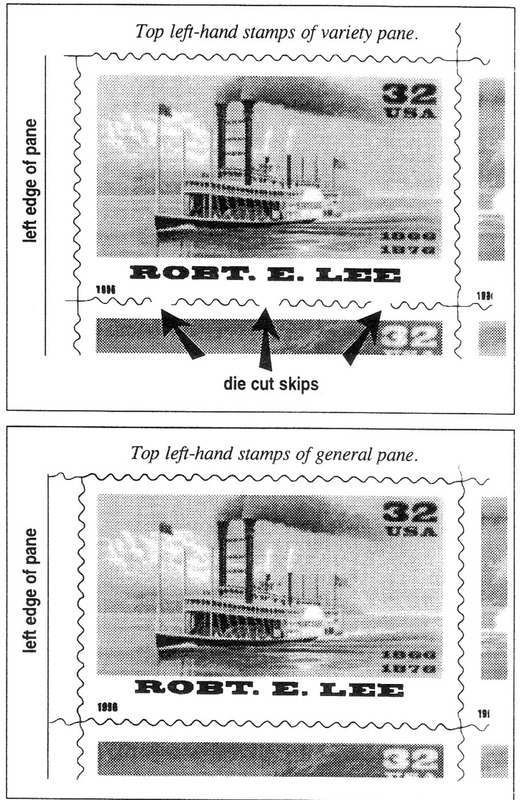 Sub-varieties relate to the different positions on the panes where a stamp has been removed. I was even lucky enough to find two booklets where no stamp was removed from the second pane in the book. Hence, each booklet has 31 stamps for the price of 30! If your post office is in the Green Bay distribution network, check to see if they have some of these very unique booklets. I'm quite interested in trading for sub-varieties that I need. If you would like a detailed list of all of the varieties that I know of, send me a note and an SASE and I'll pass along what I know. Moving on, an interesting variety of the 1 c Omnibus coil has been issued. This one was printed on shiny gum paper but is also tagged. A more common variety exists on shiny gum paper but is not tagged. The Scott catalog number listing for these stamps is quite confusing. The tagged variety is located under the major Scott #2225 listing as "pre-phosphored paper" with a value of $6.50 for a plate strip of five. The philate lic center at the main Minneapolis Post Office (1st Street and Marquette) has these stamps for face value. The Minneapolis philatelic center also has a variety of the non-denominated Mountain self-adhesive coil produced by Avery Dennison (Scott #2904A). Almost all stamps of this version have die cuts with 13 peaks (or teeth) on the left side and 12 on the right. However, all stamps produced from plate number V333342 have just the opposite configuration: 12 peaks on the left and 13 on the right. Apparently, the stamps from this plate were run through the die cutter upside down! The Minneapolis philatelic center has many interesting varieties, as the clerk is quite knowledgeable about what exists and hunts them down for collectors. Unfortunately, the center no longer sells stamps by mail; so all purchases require a personal visit. In 1995, the U. S. Postal Service embarked on a new set of nun-denominated coil stamps for the non-profit, bulk, presorted postcard, and presorted first-class rates. The multiple printers and formats of these issues have many collectors in a quandary trying to keep up with what's available. I, therefore, constructed the table below, which might help to clear the fog. Note that Scott has assigned numbers 2902 through 2912B for these issues. However, the latest stamp, just issued March 14, 1997, has not yet received a catalog number. Many if not all of these stamps are still available at a philatelic center near you. Because philatelic clerks can't sell these stamps to ordinary postal customers, they really enjoy selling them to collectors. For those collectors who like die-cut varieties, the 32¢ Statue of Liberty self-adhesive (Scott 3122) issued February 1, 1997, offers many opportunities. 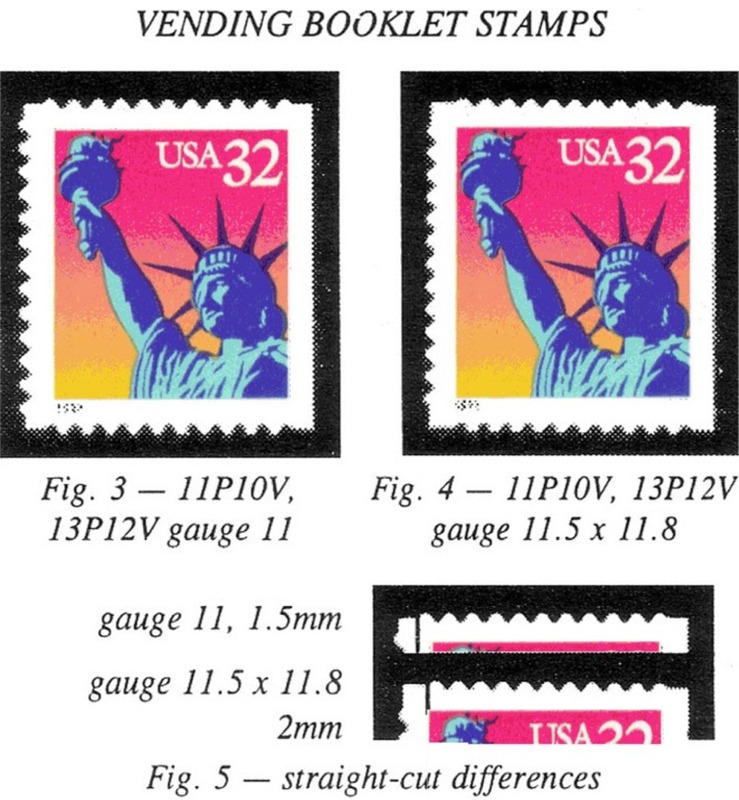 The stamp was issued in several formats, including a convertible booklet pane of 20 (Scott 3122a), as well as vending booklets of 15 (Scott 3122b-d, BK 259) and 30 (Scott 312d, BK 260). The peak/valley detail specifies the varieties. In all cases, the peak/valley combinations follow the peak/valley combinations along the top edge of an individual stamp along the left edge of the stamp. Remember that if the first part of the die cut goes down or in toward the design of the stamp, it is a valley. If it goes up or out away from the design of the stamp, it is a peak. The final part of each variety description is the die-cut gauge. Far example, one combination that exists on the convertible booklet pane of 20 is 11V10P, 13Vl2Pgauge 11. This means that along the top of the stamp, starting at the left side, the first die cut is toward the design of the stamp (a valley) and there are 11 valleys and 10 peaks. Along the left side of the stamp, starting at the top, the first die cut is also toward the design of the stamp and there are 13 valleys and 12 peaks. The final piece of information tells us the stamp measures gauge 11. 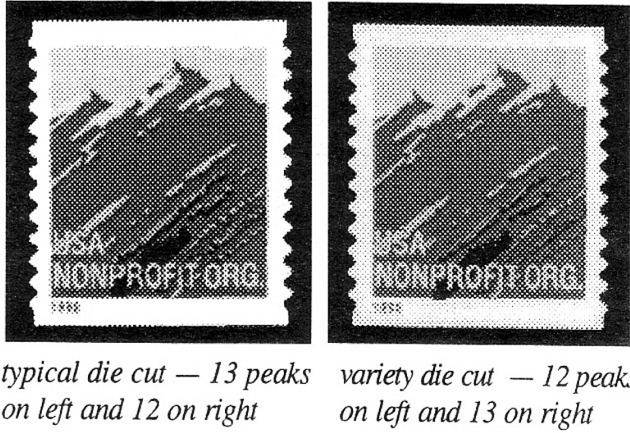 If the stamp has a straight edge along the left side of the stamp, simply invert the left side peak/valley description. Thus, 11V10P, 13V12P gauge 11 is the same as 11V10P, 13P12V(right) gauge 11 (Figures 1 and la). Notice that left and top are defaults. The convertible booklet panes of 20 provide the first two varieties. Here, stamps have been found with 11V10P, 13V12P gauge 11 (Figures 1 and la) or 12P11V, 14V13P gauge 11.5 x 11.8 (Figure 2). In this case, one can tell the difference by simply counting the peaks at the top of the stamps. The gauge 11 has 10 peaks, while the gauge 1 l.5 x 11.8 has 12 peaks. In addition, both varieties exist on panes with the "Stamps etc." promotion as well as the "National Domestic Violence Hotline" promotion printed on the back of the panes (see illustration). Vending booklet stamps can be differentiated from those originating from the panes of 20. 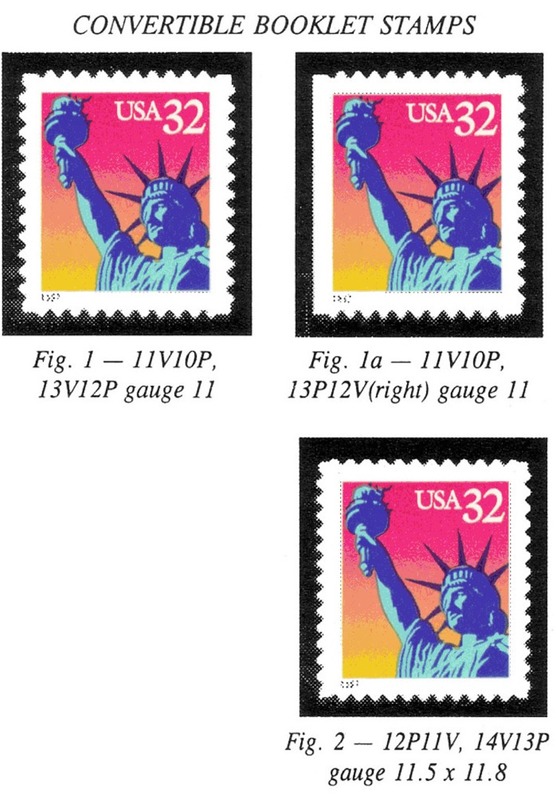 Here, stamps have been found with 11IP10V, 13P12V gauge 11 (Figure 3) and 11P10V, 13P12V gauge 11.5 x 11.8 (Figure 4). These two varieties are very difficult to tell apart without a perforation gauge, but there is a subtle visible difference. Notice the straight die cut at the corners of the stamps before the peaks and valleys start. Stamps that are die-cut gauge 11 have a straight cut that is only 1.5mm long, while the gauge 11.5 x 11.8 stamps have a straight cut that is 2mm long. (Figure 5). At this time, the vending booklet of 15 has been found only with die-cut gauge 11, while the vending booklet of 30 has been found with both die-cut gauge 11, as well as gauge 11.5 x 11.8. 1 would appreciate hearing of any vending booklets of 15 that have stamps with die-cut gauge 11.5 x 11.8. To recap the available varieties: 11V10P, 13V12P gauge 11 and 12P11V, 14V13P gauge 11.5.r 11.8 originate from the convertible booklet panes of 20. In addition, both varieties are found with the two types of promotional text printed on the back of the pane. 11P10V, 13PI2V gauge 11 and 11P10V, 13P12V gauge 11.5 x 11.8 originates from the vending booklets of 15 (only known gauge 11) and 30 (known both gauge 11 and 11.5 x 11.8). Good luck on hunting down these varieties! Flag Over Porch (Scott 2920a), 32 ¢ Statue of Liberty (Scott 3122a) and the 32 ¢ Yellow Rose (Scott 3049a). 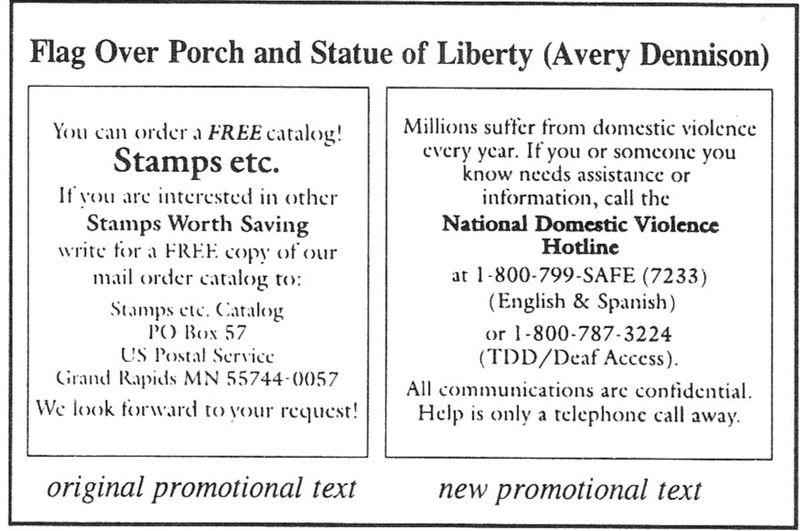 On the stamps produced by Avery Dennison, the promotional text contains information on the National Domestic Violence Hotline (32 ¢ Flag Over Porch and 32 ¢ Statue of Liberty), while the stamps produced by Stamp Venturers contain a promotion for the Stampers magazine (32 ¢ Yellow Rose). Flag Over Porch - Originally, the Flag Over Porch issue was printed with a promotion for a free copy of the Stamps etc. catalog. Numerous plate numbers exist with this promotion. The new printing has already been produced with several of these numbers. At the Auburndale, WI, post office (which is serviced by the Green Bay Stamp Distribution Office), I found plate number V36743. In Madison, WI, as well as Minneapolis, MN, I found plate number V34745. Statue of Liberty - Like the Flag Over Porch issue, the 32 ¢ Statue of Liberty was originally printed with the Stamps, etc. promotion. Plate numbers used on these printings are V1111, V1211 and V2122. The V1111 exists only as die-cut gauge 11, while the V1211 and V2122 exist as both gauge 11 as well as gauge 11.5 x 11.8. On the new printings, the same three plate numbers exist plus a fourth, V2222. Varieties of the die-cut gauges also exist on these convertible booklets: plate V1111 is the only one known having gauge 11, while the other plate numbers exist in both gauge 11 and 11.5 x 11.8. Locally, I found plate V1211, gauge 11.5 x 11.8 with the new promotional text. Plate V1111 has been located in northern Wisconsin near Ashland, WI. In Madison, WI, I found plate V2122 gauge 11. 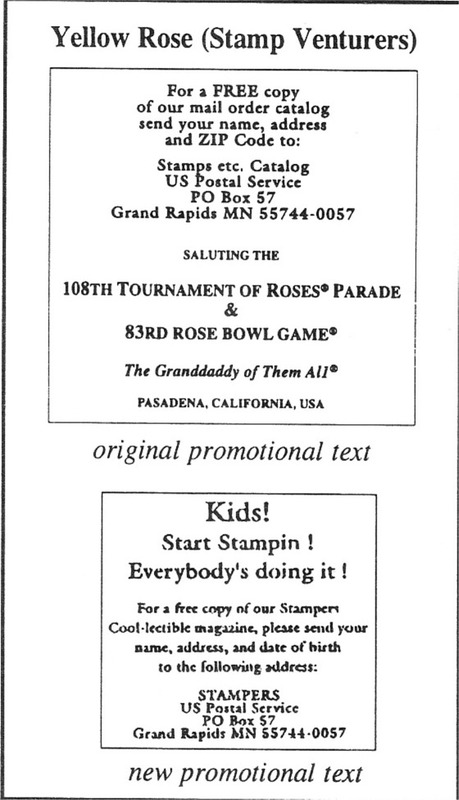 Yellow Rose - Finally, the original 32 ¢ Yellow Rose convertible booklet contained a promotion saluting the 108th Tournament of Roses® Parade and was produced with plate number S1111. Plate numbers S1111 and S2222 are found on the new printings. Locally, I found plate S1111. I found plate S2222 at the Madison, WI, post office. The information here is current as of the end of July. I would expect additional plate numbers to appear in the future. Many 7-Eleven stores around the nation are selling self-adhesive panes of 20 with a special label attached to the back of the panes promoting sales of 7-Eleven phone cards. The gold colored sticker covers the entire back of the pane and includes scoring at the places where consumers would normally fold the pane to carry in a purse or wallet. over face value). Collectors have found prices varying from $7 to $7.80, so it would appear that the price charged might be at the discretion of the store manager. Over Porch and Statue of Liberty panes, disavows any connection with the labels. Therefore, it is safe to assume 7-Eleven has privately contracted out the creation of these collectibles. For Wisconsin collectors, acquiring the panes will be quite difficult as there are no 7-Eleven stores in the state. I received the panes in my collection from traders in Missouri, Michigan, New York, New Jersey and Oregon. For a map of 7-Eleven franchises, the 7-Eleven Web site at http://www.7-eleven.com/ franchise/map.html is worth a visit. If you want any of these panes for your collection, now is the time to contact friends and family in the states with franchises to get some of the panes for you. As you can see from the illustration, the coupon has already expired (7-31-97) and it is hard to tell how long stores will continue to sell the panes. Also remember that not all 7-Eleven stores sell the panes of stamps with the coupons. • Flag Over Porch - plate numbers V13831, V13834, V23422, V34745, V36743, V42556, V45554, V56663 and V78989. All of the panes that I have seen have the USPS National Domestic Violence Hotline promotional text. V 1111 and V 1211. All of the panes that I have seen are die-cut gauge 11. 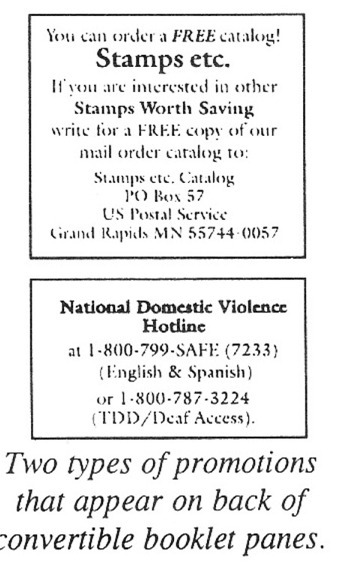 The panes with V1111 have the National Domestic Violence Hotline promotional text, while the V1211 panes have the Stamps etc. promotion. Several definitive stamps produced by the Banknote Corporation of America exist with new selvage marking layouts. The stamps involved are the 20c Virginia Apgar; 55c Alice Hamilton, MD; and the 78c Alice Paul. The 78c Alice Paul reprint was first reported in Linn's Stamp News in their August 18,1997, edition and covered in more detail by Stamp Collector in their October 6, 1997, edition. Observing the layout of the selvage markings and the width of the selvage is the easiest way to identify the reprints from previous printings. 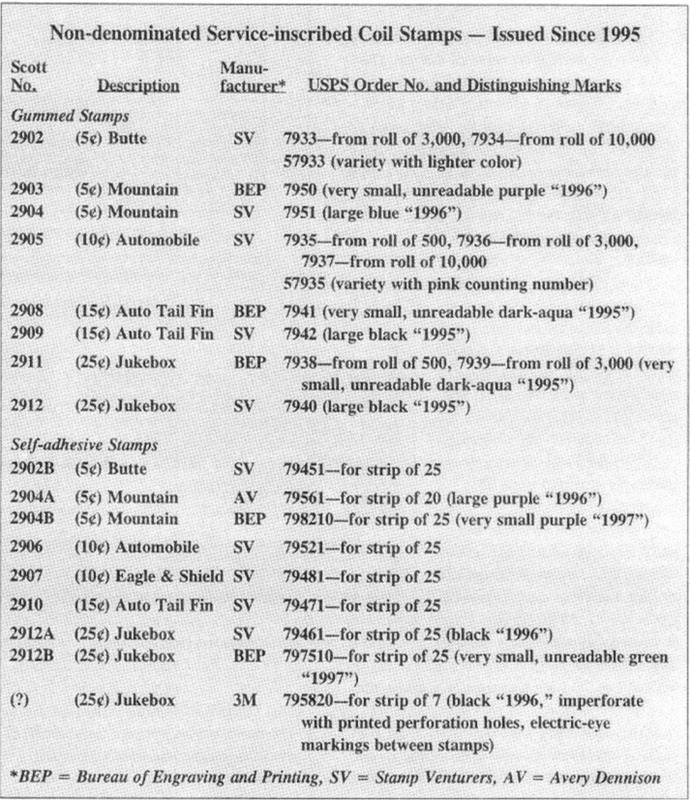 Previously, the 55c and 78c panes had the pane position diagram in row two of the selvage, the USPS promotions in rows three through five, and the copyright notice and price computation in row seven. Plate numbers appear in rows one and 10. On the 20c Apgar stamp, upper pane positions had the plate number in row one, the copyright notice in row seven, and the price computation in row 10. Lower pane positions had the price computation in row one, the copyright notice in row four, and the plate number in row 10. The width of the selvage is about 14mm. The new layouts have the pane position diagram in row four, the copyright notice in row five, and the price computation in row seven. Plate numbers appear in rows one and 10. The width of the selvage is 10mm. Let's compare the new printings with previous versions of the stamps. The first printing was in a shade that Scott calls red-brown (I believe that it is closer to orange-brown) and was from plate Nos. B1 and B2. Tagging characteristics under short-wave ultraviolet light appear somewhat smooth. A second printing with a deep orange-brown shade was also produced from plate No. B2. As with the first printing, the tagging is somewhat smooth. The latest printing, with-plate No. B3, again has a deep orange-brown shade. Tagging is very grainy. The first printing exists with plate Nos. B1 and B2. The latest printing is from plate No. B3. On all versions, tagging is very grainy. In fact, the only difference I can see is that the perforation holes are much larger on the original printing. The first printing exists with plates Nos. B1 and B2 in a shade of bright violet. Tagging is smooth and bright. A second printing, made on a different type of paper, has a bluish-violet shade with plate No. B1. Tagging is very grainy. The latest printing has a pale-violet shade with plate No. B2. Tagging, again, is very grainy. For those of you who collect plate blocks (there might be a few of us left), I highly recommend collecting these as plate blocks of eight with the plate number and the pane position diagram. This arrangement shows the true position of your plate block. The Madison Philatelic Center has all three of the new printings, but does not do mail-order business. The Milwaukee Philatelic Center (which does mail-order business) has the 55c Hamilton as well as the bluish-violet shade of the 78c Paul, in case you missed it. The address for the Milwaukee Philatelic Center is: Main Office Window, USPS, % Philatelic, P.O. Box 5066, Milwaukee, WI 53201-5066. The philatelic clerk's name is Jane. Make checks payable to Postmaster.